The Fitzrovia BID is planning to install electrical cables and lights in mature trees on Fitzrovia streets. Picture source: The Festive Lighting Company. 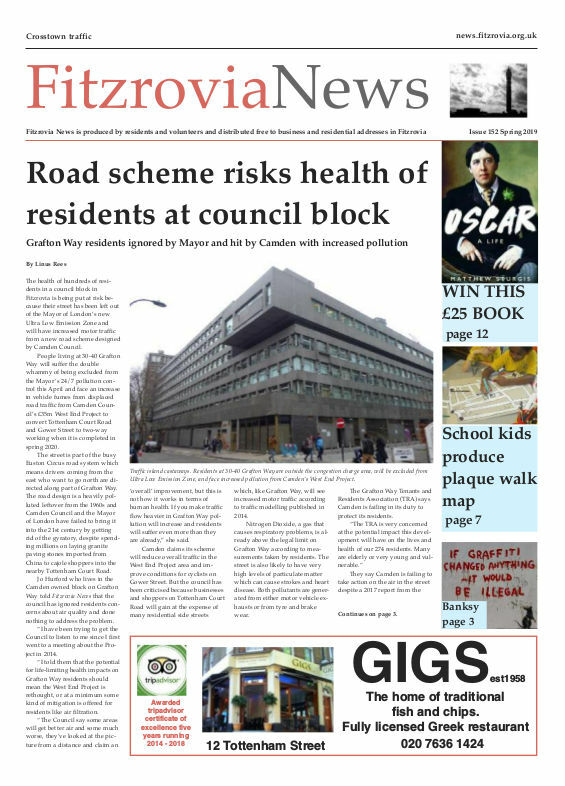 By News Reporters Plans by the Fitzrovia Partnership Business Improvement District (BID) to install electrical cables and lights in mature trees in Fitzrovia have been criticised by some residents. The Fitzrovia BID have announced plans for Christmas lighting in Tottenham Court Road, Charlotte Street, Goodge Street, Percy Street, Howland Street and Fitzroy Street. There are plans to install chandeliers on lampposts and two 10 metre high Christmas Trees would be placed at Whitfield Gardens and outside University College Hospital on Euston Road. The Fitzrovia BID are paying for the lighting. 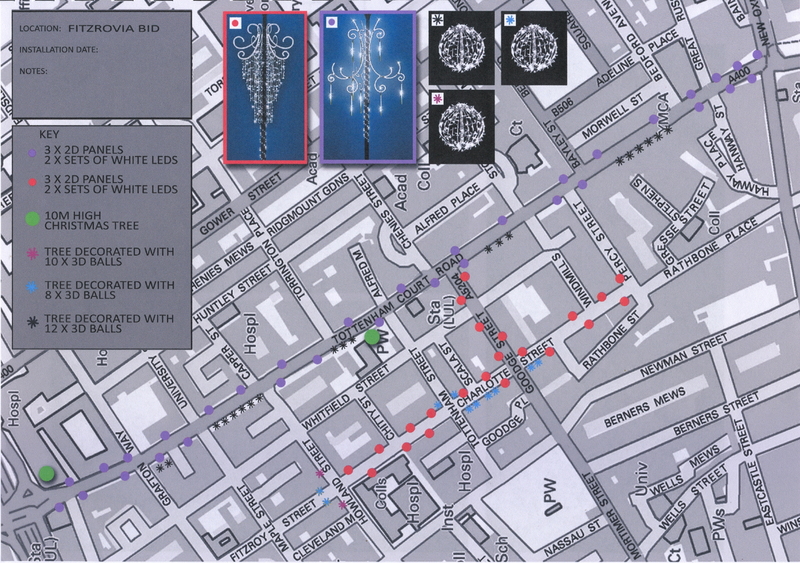 The Fitzrovia BID plans to install festival lighting in trees and from lampposts. However, there are also plans to hang balls of LED lights from 30 mature trees. Many residents have expressed concern that the trees are being used for commercial gain, to encourage shoppers and customers into restaurants and bars. Tottenham Street resident and assistant editor of Fitzrovia News Linus Rees says it is wrong in principle to be using these precious trees for commercial purposes. “Allowing the use of these mature trees for commerce is wrong. The trees have their own inherent beauty and should be appreciated for that. Whilst I accept that the lights and cables are unlikely to harm or damage the trees I strongly believe it is wrong in principle to use trees, some of which are more than 30-years-old, to attract Christmas shoppers and restaurant customers. “The trees are public property maintained by Camden Council and are an important part of the natural environment that enhances our built environment. Hanging lights and cables in these trees particularly in a conservation area sends out a message that these trees are to be part of the trading and commercial environment and to be exploited. “People should recognise the irony of hanging electrical lighting in these trees that do so much to help offset our carbon emissions, and when in full foliage help to reflect sunlight and help cooling by combating the ‘urban heat island’. A recent report by the Forestry Commission describes how important urban trees are in lowering temperatures in cities. 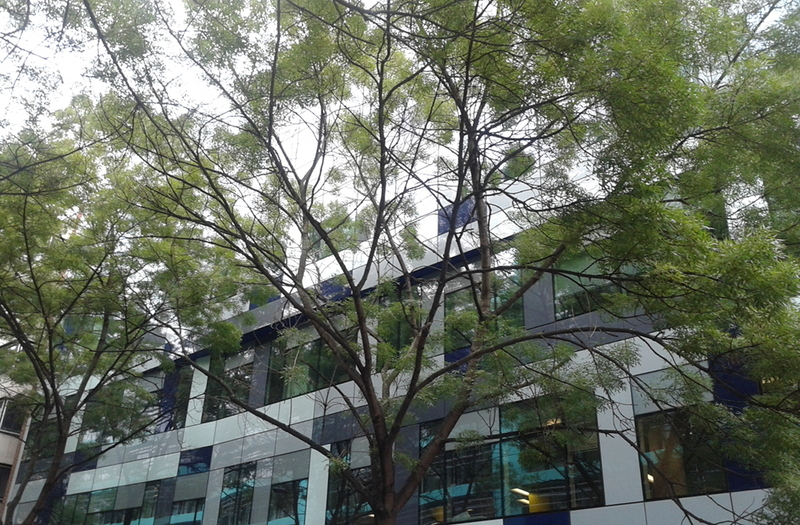 Acacia trees outside Arup’s offices in Fitzroy Street. 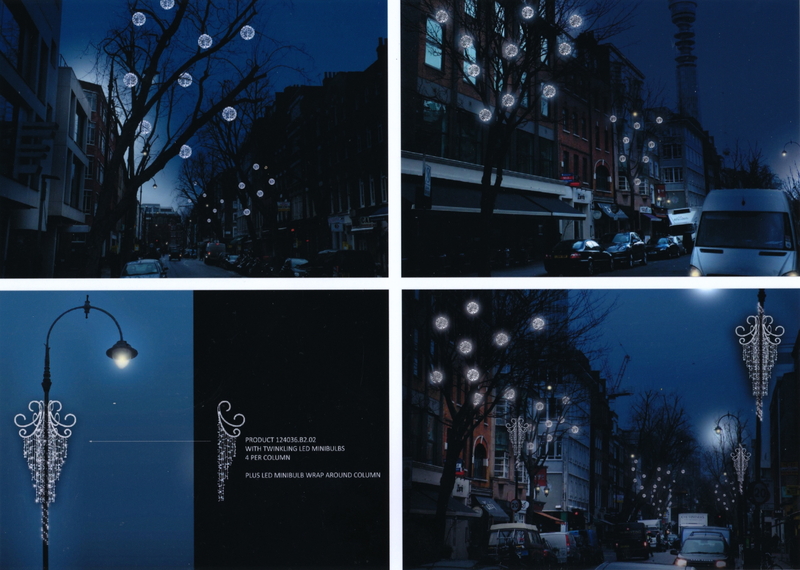 The Fitzrovia BID want to hang lights from the trees. Some residents didn’t wish to go on record but criticised the size of the proposed lighting in the trees. The spherical light balls to be installed in trees on Tottenham Court Road would be 50 cms in diameter. Many residents in Goodge Street have not welcomed the lighting because it will attract people into the street in the evening adding to noise nuisance. The lights which are being supplied by the Festive Lighting Company under a four-year contract will be switched on at dusk and turned off at 11.30pm. They will be removed after the Christmas period but the cables will be left attached to the trees all year round. The Fitzrovia Christmas Lights will be switched on for the first time on the evening of Wednesday 13 November. Many of Fitzrovia’s street trees have been damaged by vehicles and have also suffered from disease. Residents expressed concern after a tree in Warren Street was cut down recently. Linus Rees also campaigned in 2010 to have lights removed from trees.